Do you know someone who is deaf or hearing-impaired? Where do they work? I recently heard about Mozzeria. “Mozzeria is ranked among the top pizza places in San Francisco, and it is also notable for being entirely owned and operated by people who are deaf,” said Tracy Smith. The story about Mozzeria is fantastic and has inspired me to shine a spotlight on ensuring the safety of those workers who are deaf or hearing-impaired. Job hunting is a grueling process, but imagine how grueling it would be for someone who is deaf or hearing-impaired. How many jobs require you to talk on the phone? Attend meetings? Evacuate during an emergency? Someone who is deaf or hearing-impaired could present significant challenges for almost every employer, but they deserve to be considered for the role just as much as someone without hearing disabilities. “In 2014, for deaf people, the most common [occupational] field is manufacturing, with 13.2% of deaf people employed, and the least common field is utilities (1.1% employed).” – National Deaf Center. Employing someone who is deaf could certainly present challenges because effective communication would be at risk. Accommodations would certainly need to be in place to effectively communicate safety training, emergency instructions, and general procedures. “For those with severe and profound hearing losses, a common safety concern is localization. For example, knowing forklifts are in the area, but not knowing where they are coming from. Fortunately, accommodations and equipment modifications are available to assist hearing-impaired workers to perform their jobs safely.” – OSHA. Position a rear vision camera so that a vehicle operator will be able to see behind him/her. Tape recorded meetings for the purpose of transcribing later. 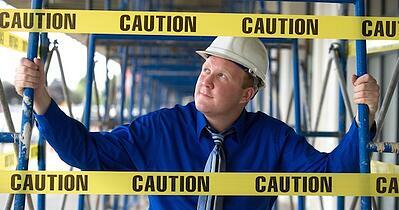 Ensuring the safety of any employee is challenging. Whether or not the employee is deaf or hearing-impaired should not interfere or alter your approach in executing effective safety measures at your job site. How difficult would it be to design and develop safety procedures and safety training while considering workers who are deaf or hearing-impaired? Your company may not currently have any deaf or hearing-impaired workers, but you probably will save valuable time and money if you proactively plan accommodations before the time comes to hire someone who will need them. This will no doubt set your organization apart and everyone will hear your mission of ensuring the safety for deaf workers – loud and clear.